Protein frequently is the most limiting nutrient for cattle wintered on poor to moderate quality harvested forages, as well as for mature cows and growing cattle grazing dormant grass pastures and crop residues. Ample amounts of protein are required for cattle to efficiently harvest energy from forage-based feeds. This protein is needed to support a healthy, active population of fiber-digesting microorganisms in the stomach. Consequently, when dietary protein is limiting, fiber digestion is not optimal. Poor digestion results in inefficient energy use, and often decreases feed intake too. The combined effect of these factors is a significant decrease in overall energy balance for the animal. This can limit growth rate of young animals or lead to poor body condition scores in reproducing cows and heifers. A study was performed at the Kansas State University Beef Cattle Research Center using 175 crossbred beef heifers averaging 683 pounds. Heifers were fed low quality prairie hay free-choice, or the same hay supplemented with 5 pounds daily of alfalfa hay. Heifers within each forage group had access to NGS-12, NGS-30, or no supplement. Heifers were fed the forage-based diets for 89 days, and had free access to white salt and water at all times. Daily gains, feed intakes, and efficiencies of heifers are shown in Table 1. Heifers fed prairie hay with no alfalfa actually lost weight, indicating that the hay had limited energy content. Performance was improved substantially by feeding blocks. In particular, the higher protein content of NGS-30 improved forage intake and reduced weight loss compared to the unsupplemented controls. 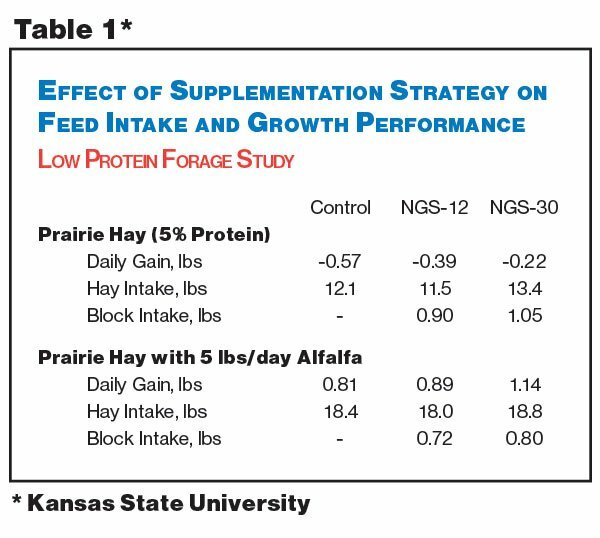 Feeding five pounds of alfalfa daily effectively increased overall energy intake by heifers, allowing for a substantial improvement in gain compared to heifers fed only the prairie hay. Feeding NGS-12 and NGS-30 resulted in additional boosts in gain and efficiency, illustrating that NGS supplements are effective over a range of forage qualities.